These 10g mini balls of sock yarn from Opal are extremely cute and versatile. We have a mixture of colours available (please request desired colour on order - e.g. shades of red, or we will choose a colour at random). Please note that the price is for one mini ball. The mini skeins have a wide range of uses including adding a colourful edge or border to existing projects, creating toys or doll clothes, decorations, mini socks or mittens and in the creation of blankets. 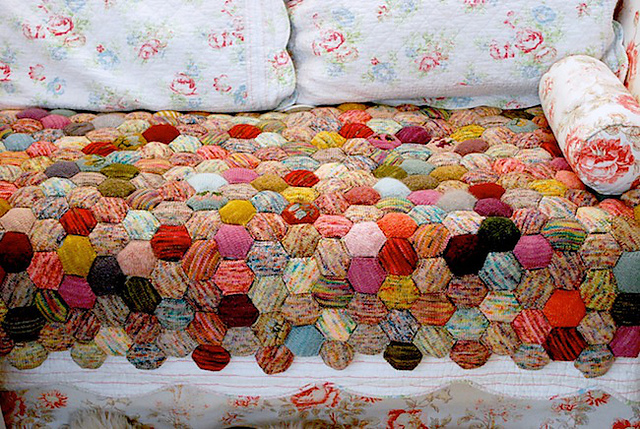 The skeins are perfect for knitting the Beekeeper's Quilt on Ravelry (image from Tiny Owl Knits on Ravelry). My customer asked me to make her 3 mini sock keyrings in bright colours, the sock yarn balls you sent are not very bright. I asked for purple orange yellow red green types or similar. Being Opal these colours might develop. Do you know you're the only store who stock mini sock balls. I have made 2 mini socks so far, No 3 sock on needles. Thanks for supplying them, they might be a popular item in my Folksy shop. I can make 2 mini socks out of 1 mini ball so have Gr8 customer service superfast delivery, I highly recommemd this store. Yoy're FAB!! !